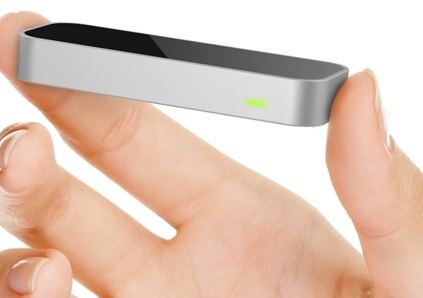 The New York Times is planning to release a gesture-based news app for the Leap Motion, reports TechCrunch. Leap Motion, which is set to be released later this month, is a touch-free device that is designed to allow users to control their computers via hand gestures in three dimensions. With the NYT app, readers will be able to browse and scroll through articles with hand movements. In the case of The Times' app, users should be able to browse articles by moving their hands left and right. Headlines, images, and summaries will be presented in a card format, and if you see something that interests you, you tap on the card to read the full article. You then scroll through the article by making a circular motion, and you shake your hand to return to the Top News menu. According to Paul Smurl, NYT general manager of core digital products, the Leap Motion app is targeted at early adopters "that are obviously very influential and can make or break a trend." The app doesn't include integration with the company's subscription system and it will only focus on top stories in the beginning, but if it proves to be popular with users it could be improved in the future. The Leap Motion controller, Smurl said, "is much more fine-tuned and sensitive to hand and finger motions than some of the competing technologies out there. … It has enough fine motor sensitivity that a reading experience is enabled and it's pretty damn good." After a delay of several months, the Leap Motion is set to ship on July 22 and can currently be preordered from the website for $79.99. The app will be available on the same day from the Leap Motion Airspace Store, which will include a number of other offerings. Careful, big guy. You paint with a broad brush. This device is evil. Just thinking about it's possibilities makes me want to buy an iMac a year before I planned. OK, I'll bite...why is it evil? In the service of full disclosure, I don't know diddley about the device, aside from what is stated in the article. Although I don't feel a desperate the device, I'm interested in why you dislike it...er...intensely? You should google it and check out some videos demonstrating it- it's the exact opposite of evil. The first responder is probably one of those people who you would have to pry a keyboard and mouse out of their cold dead hands. Like conservatives with guns. so like how silly people look when playing on the Wii and Kinect, they can now look silly in front of the computer? lol quite the opposite really. I just would really like to have something like this to navigate an iMac when I get one. I want to try it out but it wouldn't make as much sense with a portable computer and I wanted to wait and get my iMac when I start my Bachelor's next year (bfa graphic design). HP signed a multimillion dollar deal with them (something Apple should have done...) and they are integrating Leap Motion on all their laptops from August 2013 and on. I have one of their pre-release versions as we have been working on some tools that will use this controller as its principal device. I have to say that the device is right on awesome. The Kinect lets you control games with your limbs... Leap motion sits in front of your desk, and you can control things with your fingers, hands and wrist movements.